invocation, after the images of the pages. 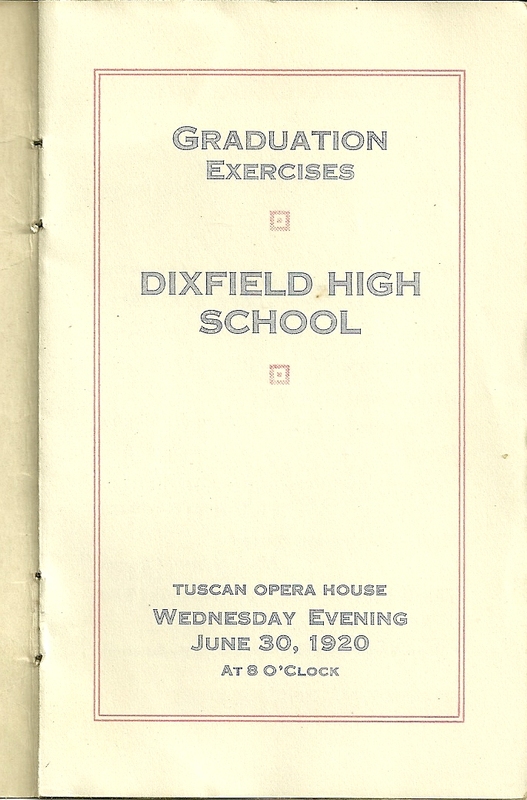 See an earlier post featuring a graduation program from the Class of 1919 at Dixfield High School, Dixfield, Maine. 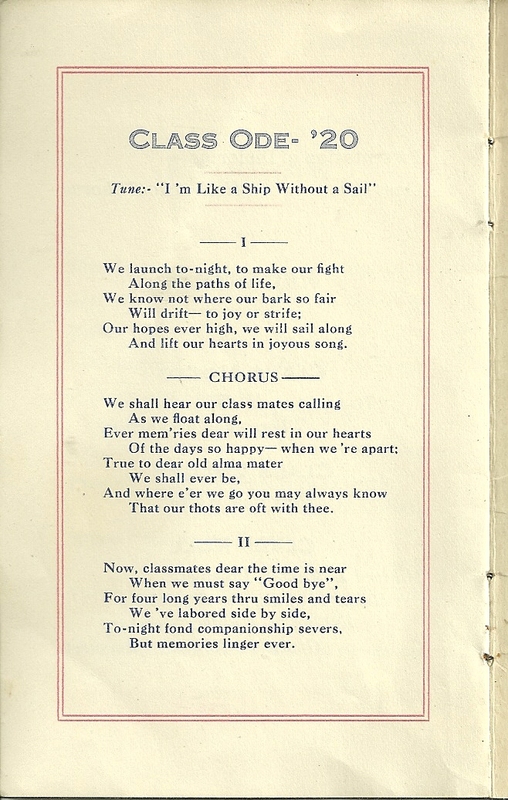 Class Motto, "To-night we launch, Where shall we anchor?" Rev. R. E. Gilkey was Rev. Ransom Eugene Gilkey, born 21 March 1857 at Sharon, Vermont, the son of John and Ann Tabor (Currier) Gilkey. His paternal grandparents were Jonathan and Polly (Spalding) Gilkey. His maternal grandparents were Abel and Sarah "Sally" (Quimby) Currier. On 9 July 1881 at Norwich, Vermont, he married Mabel Augusta Luce, who was born 6 June 1855 at Norridgewock, Maine, the daughter of Elisha and Mary (possibly Perkins, though I have yet to find any information on her) Luce. Her paternal grandparents were Elisha and Lydia (Butler) Luce. Elisha's parents were Massachusetts natives Charles and Catherine (Merry) Luce, who were early settlers at Industry, Maine. Rev. Ransom Eugene Gilkey and wife Mabel Augusta had a daughter Ida, born 18 May 1888. Her name may possibly have been Idella, as she had a paternal aunt by that name. In the 1910 Census, Rev. Gilkey and wife Mabel Augusta were living at Jackson, New Hampshire. Mabel Augusta (Luce) Gilkey died sometime before 1913. Rev. 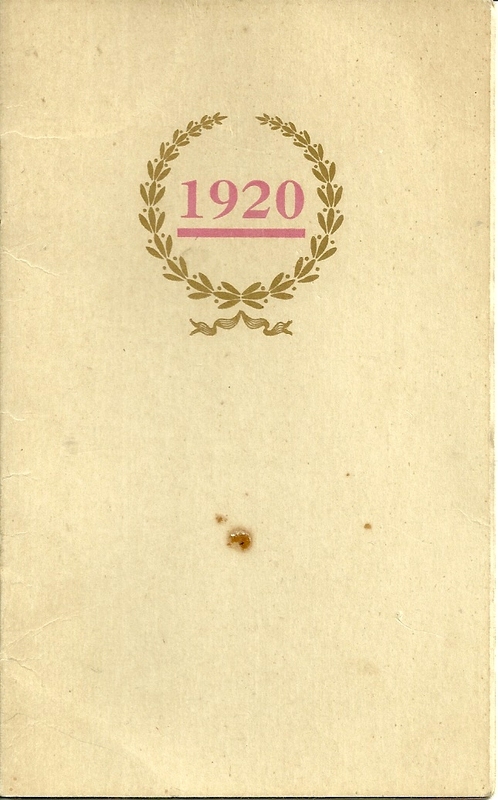 Gilkey married a second time on 23 July 1913, to Chestina (Marsh) Edwards, widow of Philip Waldo Edwards, who had two children from her previous marriage. Chestina was born 21 July 1875 in Dixfield, the daughter of Abel and Matilda A. (Newton) Marsh. Her paternal grandparents were David and Asenath Marsh. I could find nothing on the family of Asenath, though many sources give her maiden name as Park and birth at Sutton, Massachusetts in 1796. Chestina's maternal grandparents were John Burleigh Newton and wife Sarah H. Newton. I could find nothing on Sarah's parents, though possibly her maiden name was Thomas. Rev. Ransom E. Gilkey died 23 February 1924 at Dixfield. His widow Chestina died in 1930. I found a photograph of a middle-aged Rev. Gilkey and brief bio of him in Dover, New Hamshire: its History and Industries Descriptive of the City, compiled by A. E. G. Nye for the 25th anniversary of Foster's Daily Democrat, in 1895. R. E. Gilkey was born in Sharon, Windsor Co., Vermont, March 21st, 1857. He is the son of John and Ann T. (Currier) Gilkey. He was brought up on a farm where he had the advantages of a common school education. At the age of eighteen he entered Lyndon Institute, Lyndon Centre, Vt., to prepare for college. In the fall of '77 he entered Bates College, Lewiston, Me., graduating in '81. For three years he worked as a druggist, one year in Audubon, Iowa, and two years in Saco, Me.. He then entered Cobb Divinity School in Lewiston, Me., graduating in 1887. He has held four pastorates. The first of one year in New Gloucester, Maine, the second of two years in the Corliss Street Church, Bath, Me., the third of four years in the Brown church, Richmond, Me. He entered upon the labors of the fourth and present pastorate May 1st, '92. Salutatorian Mary Thalia Andrew was born 2 August 1901 at Dixfield, Maine, the daughter of Philip M. and Cora May (Dorr) Andrew. Her paternal grandparents were William and Jennett B. (Matthews) Andrew. Her maternal grandparents were Cyrus and Zerviah B. (Weaver) Dorr. On 23 November 1921, Mary Thalia Andrew married Harold M. Blaisdell, who was born 6 June 1901 in Jay, Maine, the son of Frank and Rossie (Blaisdell) Blaisdell. His paternal grandparents were Samuel and Laura Blaisdell. His maternal grandparents were Consider and S. P. Blaisdell. Harold M. and Mary Thalia (Andrew) Blaisdell lived at Dixfield, Maine, and had at least one child, a son. Kathleen Works was born Mary Kathlyn Works on 18 July 1902 at Dixfield, Maine, the daughter of Villroy Burton Works and wife Inez M. (Starkey) Works. 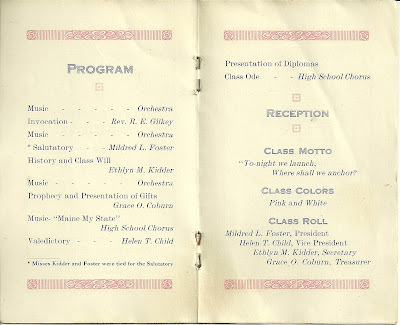 I'm not sure why her name appears at Kathleen Works on the graduation program; perhaps it was a mistake, or perhaps she preferred that spelling. Her paternal grandparents were Abel and Mary (Jones) Works. Her maternal grandparents were Isaac Newton Starkey and wife Alice May (Fanjoy) Starkey. On 4 June 1938 at Dixfield, Maine, she married Victor Abbott Mayson Staples, who was born 19 October 1885 at Carthage, Maine, the son of Eugene Hale Staples and wife Pamelia (Sanborn) Staples. His paternal grandparents were John Babson Staples and wife Lois D. (Parker) Staples. His maternal grandparents were Moses and Pamelia S. (Mason) Sanborn. Victor and Mary Kathlyn made their home at Dixfield, Maine. Victor died at Dixfield in 1963, and Mary Kathlyn died at Vacaville, California in 1987. Victor had children from before his marriage to Mary Kathlyn, but I don't know if he and Mary Kathlyn had any children together. Helen Thelma Child was born 12 February 1903 at Peru, Maine, the daughter of William Walter Child and wife Etta E. (Card) Child. Her paternal grandparents were Granville Fitchland Child and wife Viola Bosworth (Wing) Child. Her maternal grandmother was Emma Dixon, but I haven't yet learned the first name of her maternal grandfather Mr. Card. 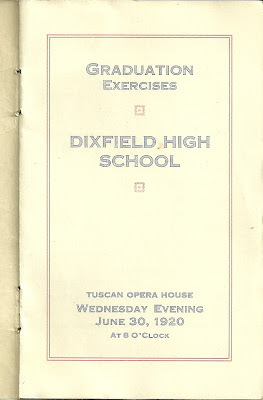 Helen was working at a clothes pin mill and living at home in Dixfield with her parents at the time of the 1930 Census. There's a listing for a Helen Childs of Dixfield in the Maine Marriages database, so it's possible that this is she. In fact, I found several records where the family's last name was spelled as Childs. If so, our Helen married Roger N. Swan, also of Dixfield, on 23 April 1932. 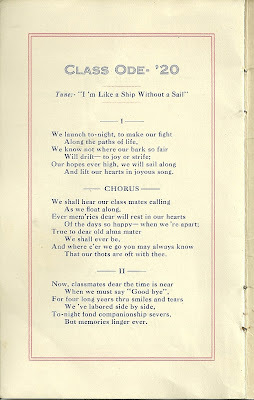 Roger N. Swan was born about 1908 in Maine, the son of George H. and Linnie M. (Reed) Swan. His paternal grandparents were Nathaniel S. F. and Elizabeth Perry (Bean) Swan. His maternal grandparents were Charles and Ida A. (Knight) Reed. I'm not sure whether Helen and Roger Swan lived at Dixfield after their marriage or if they had children. They may have lived at Rumford, Maine, as Roger died there in 1988 and Helen died at Dixfield in 1991. 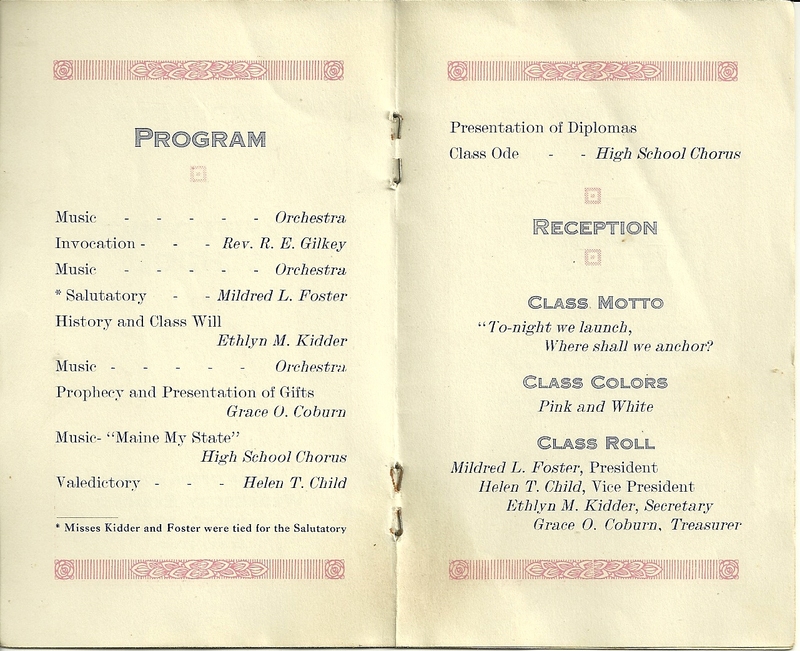 Ethelyn Kidder [or Ethlyn Kidder, as her name is spelled in the program above.] was born 1 May 1901, the daughter of Irving Charles Kidder and wife Hattie B. (Holman) Kidder. Her paternal grandparents were Charles H. and Matilda J. (White) Kidder. Her maternal grandparents were Horace and Betsy (Hutchinson) Holman. On 30 September 1925, Ethelyn Kidder married Glendon O. Babb. He was born 31 December 1901 at Dixfield, Maine, the son of William Ordway Babb and wife Ida M. (Brackett) Babb of Dixfield. His paternal grandparents were Ira Orlando Babb and wife Francelia A. (Hutchins) Babb. His maternal grandparents were Dwinal P. and Olive E. (Thompson) Brackett. Ethelyn and Glendon were living at Dixfield at the time of the 1930 Census, and they had a daughter. They may have had more children later. Glendon Babb died in 1967 in Florida. Ethelyn (Kidder) Babb died in 1999. Grace Olive Coburn was born 25 May 1902 [although there is a strikeout on the birth record, and it could be 1903] in Weld, Maine, the daughter of Henry Wheeler Coburn and wife Minnie E. (Holt) Coburn. Her paternal grandparents were George Newton Coburn and wife Olive Rowell (Wheeler) Coburn. Her maternal grandparents were Daniel E. and Elmira J. (Fuller) Holt. On 4 January 1922 at Dixfield, Maine, Grace Olive Coburn married Robert Eugene Ames. He was born 6 September 1898 at Dixfield, Maine, the son of Charles H. and Alice M. (possibly Fisher) Ames. His paternal grandparents were John B. and Armenia H. (Brock) Ames of Searsport, Maine. It appears that Charles found his way to Dixfield and met Alice, who was born there about March 1871. I don't have any information on Alice's parents, or if Fisher was her maiden name. I think Robert and Grace are the couple enumerated in the 1930 Census of Lowell, Massachusetts, but I'm not positive. If so, they had two daughters by that time. Robert died at Rumford, Maine in 1970. Grace died at Dixfield, Maine in 1972. Mildred Louise Foster was born 9 March 1902 in Dixfield, Maine, or Wilton, Maine, the daughter of Charles Sherbrook Foster and Birdena M. (Whittemore) Foster. Her paternal grandparents were Hiram Orlando Foster and wife Mary J. (Phinney) Foster. Her maternal grandparents were Nathaniel Kendall Whittemore and wife Jane "Jennie" Wing (Staples) Whittemore. On 16 June 1926 in Oxford County, Maine, she married Peter Daniel Matheson, who was born 10 June 1904 in New Hampshire. I haven't yet found information on his parents. In the 1930 Census, Mildred and Peter were living at Dixfield, Maine, in a household with Mildred's parents, Charles and Birdena Foster. I don't know if they had children after that. Mildred (Foster) Matheson died at Dixfield, Maine, in 1980. Peter died at Boston in 1995. 1919 Valedictorian Mary Gordon was born 3 February 1902 at West Peru, Maine, the daughter of Grafton Bradbury Gordon and wife Flora A. (Wyman) Gordon. Her paternal grandparents were George W. and Esther Jane (Child) Gordon. Her maternal grandparents were John Calvin Wyman and wife Frances (Robinson) Wyman. On 29 June 1920 at Rumford, Maine, Mary Gordon, who was then a teacher, married pastor Chester Bradford Oliver. He was born 15 September 1895 in Portland, Maine, the son of William Sprague Oliver and wife Hannah Alvena (Perry) Oliver. His paternal grandparents were Washington and Mary Jane (Hinkley) Oliver. His maternal grandparents were Joseph and Anna Perry. In the 1930 Census, Chester and Mary were living at Livermore Falls, Maine; there were no children listed with them. Chester died in 1970 at Oakland, Maine; Mary died in 2000 at Peru, Maine. FindAGrave notes that Ethlyn M Kidder Babb died in 1999, not 1982.